In a twist as bizarre as the subject matter, a 2010 FoxNews.com story, written by reporter John Brandon, has predicted the new surge in time travel research. GRANDVIEW HEIGHTS, Ohio - Jan. 27, 2019 - PRLog -- Freaky Physics Proves Parallel Universes Exist said the FoxNews.com headline by reporter John Brandon, and the story was a startling one. The 2010 discovery by quantum physicists at the University of California Santa Barbara, led by Andrew Cleland, showed how an object in front of you can exist simultaneously in a parallel universe -- a condition some physicists see leading to time travel possibilities. However, that's nothing compared to what's happened since 2016. Working from an entirely different premise with a more robust and complicated basis, internationally noted R&D engineer, Marshall Barnes has gone beyond that. 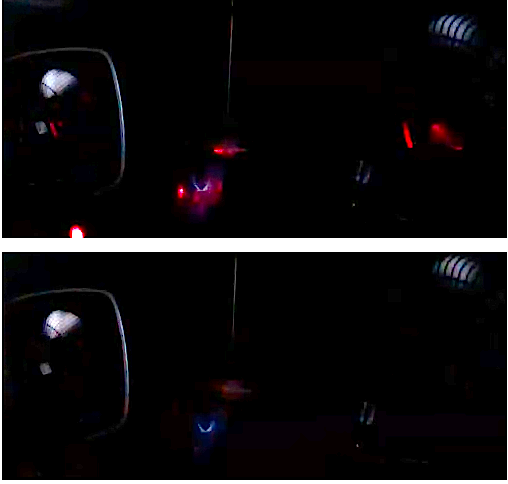 He's subjected laser pulses to the same which-way-path changes physicists have experimented with, and observed laser hits in detection areas in between laser pulses. In other words, effects without a cause. "That isn't as strange as it sounds because we have a complete model of what's happening," Marshall states. "First, all of these experiments are filmed because we have to look for the anomalous hits on a frame by frame basis or we can't tell if they've happened. The shutter system that changes the path for these pulses, causes the pulse hit in the detection area at a time when no pulse has been fired, because the universe has decohered and we see the hit without a pulse because the pulse has been left behind in the previous universe." 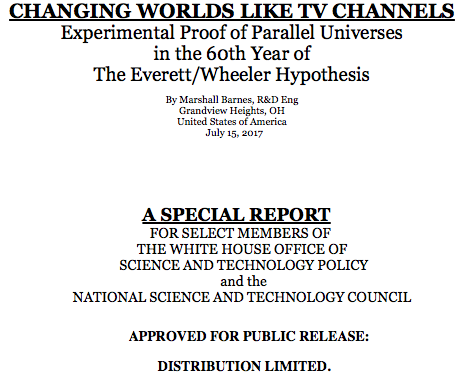 Marshall's actually proved the Everett Relative State Interpretation, in total, is true (where the parallel universes theory comes from) along with the existence, over all, of the Participatory Universe model made famous by John Archibald Wheeler. It's actually the Participatory Universe which puts into action all of the weird quantum phenomena, including the splitting of parallel universes, called 'decoherence'. Not surprisingly, as in the Brandon article, Marshall's findings have major implications for time travel, and he's figured out how to do it. It's all revealed in an article written by Marshall and published by Higgypop.com last November. It's based on his science research that's been published in pre-print form at Academia.edu. 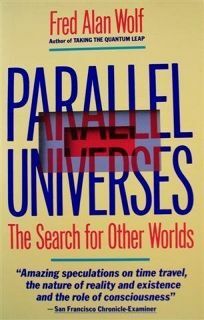 Also startling is the similarity in the titles - Parallel Universes Are Now Proved Real: Next Time Travel. "It's bizarre," Marshall says, while preparing for a major event in Connecticut, "but I'd never seen that article before someone else brought it to my attention because of my Higgypop article. I remember the Cleland team's discovery from a science magazine that didn't mention time travel." It turns out it also didn't mention comments from the scientists, Marshall knows, or has had some contact with, including JR Gott, Ben Bova, Fred Alan Wolf. 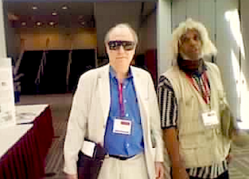 In fact, Wolf served as an mentor for Marshall back in the early '90s and agreed with Marshall's conclusions from the early versions of his parallel universe experiments in 2016. "It all comes down to how we understand time," Brandon reports and it just so happens, Marshall Barnes is arguably the world's expert on the subject. His research on how to resolve the apparent temporal paradox in retrocausality experiments led to his discovery that such experiments don't change the past of a particle, but instead create a new, parallel universe copy of the present which now has a different past. "Cleland has proved that quantum mechanics scale to slightly larger sizes," writes Brandon. "The next challenge is to learn how to control quantum mechanics and use it for even larger objects. Do so -- and we might be able to warp to parallel universes just by manipulating a few electrons." Marshall's Higgypop article reveals he's one step away from making time travel real, similar to that predicted in Brandon's article - by using quantum mechanics to induce a quantum shift from the present to a parallel universe copy of a past time, and he's gotten some funding to help. "I plan on taking the results, so far, and presenting them to those two Silicon Valley billionaires who want to fund research on how to escape what they think is the simulated universe," Marshall says. "I can show them how they can go to 1983 and start over by taking the lead in the personal computer explosion." You can read the details in his article, What To Get Those 2 Silicon Valley Billionaires Who'll Be Stuck Here Because The Simulated Universe Doesn't Exist. The Morning of the End Of Timeless, Marshall Barnes Announces: The Cusp of Real Time Travel Is Here!